Why Does Cilantro Taste Like Soapy? Why Does Cilantro Taste Soapy? Cilantro is one of the most polarizing foods out there. People either love it or hate it, with opinions rarely falling in the middle. 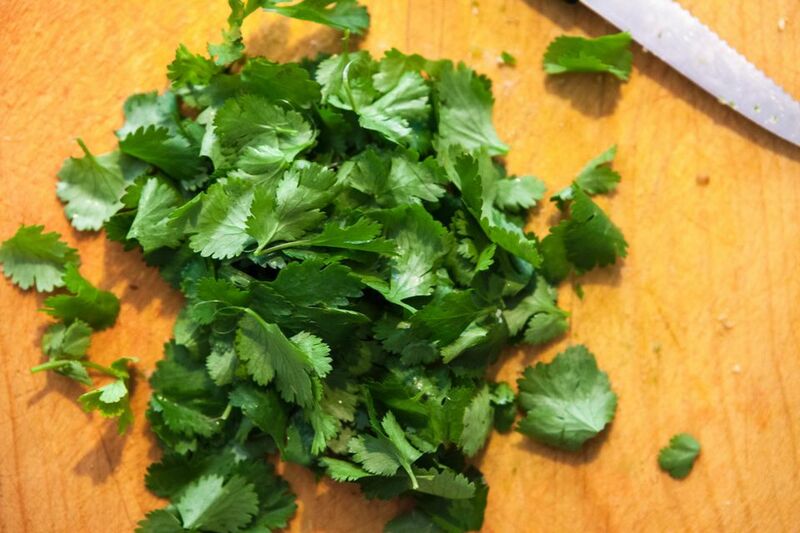 Most people who dislike cilantro describe its flavor as being similar to soap or metal. Some reactions to cilantro are so strong that even just the scent can make a stomach turn. But for those who love cilantro, it is the epitome of freshness with its bright, breezy flavor. There are probably both genetic and cultural reasons for these strongly opposing views. Cilantro is the leafy green portion of coriander, a plant whose seeds and roots are also used to season food. Both coriander and cilantro are used extensively in cuisines throughout Asia and in Central and South America. Although coriander and cilantro are part of the same plant, their flavor is quite different. Coriander seeds are roasted and used whole or ground. Cilantro is used fresh. It frequently tops Indian dishes and is used in salads in South Asia. In Mexican and Southwestern cuisine, you will find cilantro in salsa. In Moroccan cooking, chermoula is a kind of pesto made with cilantro, while zhug is a Yemeni hot sauce with cilantro that is becoming popular. Cilantro contains a natural chemical compound, called an aldehyde, that can taste unpleasant to some people. Aldehydes are compounds that are also produced in the soap making process and by some insects. For this reason, some people describe the flavor of cilantro as soap-like or as tasting similar to a stink bug. As well, some associate the smell of a bedbug-infested room with cilantro. Fortunately, not all people interpret the smell and flavor of these aldehydes in this way. How you interpret the flavor of aldehydes is partly rooted in genetics. Olfactory receptor genes have been linked to the interpretation of cilantro as either soapy or herbal. A study of twins found a link between three gene variants and the aversion to cilantro. Identical twins usually shared their views of cilantro while the likes of fraternal twins varied as much as for non-twin siblings. Another study used data from 23andMe to look at the genetic codes of over 30,000 people, comparing whether they described cilantro as enjoyable or soapy. A single nucleotide gene variant in a cluster of olfactory receptor genes on chromosome 11 was strongly associated with the differing taste for cilantro. One of these genes, OR6A2, is specific for binding the aldehydes found in cilantro. However, the researchers noted that carrying the genes did not guarantee a dislike for cilantro. So what gives? Taste preferences influenced by both nurture and nature. As with many things, what you like to eat is a complex mix of your genes, what you have been exposed to, and what you are familiar or comfortable with. Through repeated exposure and associating cilantro with new and enjoyable foods, some have found their opinion of this love-or-hate herb to change. It is interesting that aversion to cilantro varies with ethnicity. A University of Toronto study of over 1,600 adults between the ages of 20 and 29 years rated their preference for cilantro from extreme dislike to extreme liking. The ethnic groups who had very few members disliking cilantro were South Asians (7 percent disliked), Hispanics (4 percent disliked), and Middle Eastern (3 percent disliked). The groups who disliked cilantro the most were East Asians (21 percent disliked), Caucasians (17 percent disliked), and people of African descent (14 percent disliked). It is no wonder that cilantro is found more frequently in the cuisine of the regions where fewer people dislike it. But it is harder to tease out whether the lack of genes that make cilantro taste bad is the reason or that people become familiar with cilantro from an early age and associate it with their favorite foods. For those looking to acclimate themselves to cilantro, mincing, pulverizing, or crushing cilantro is a good place to start. Bruising cilantro through these methods releases enzymes that break down the offending aldehyde compounds, leaving them less flavorful and aromatic and allowing other flavor compounds to shine through. Cooking cilantro also greatly reduces its potency, which is why most recipes call for adding it fresh as a topper after cooking. If you're looking for a little cilantro flavor without a super strong in-your-face presence, try adding it to food as it cooks to lessen its strength.